Municipal bonds are usually tax-exempt. This is an advantage for cities, as interest rates are lower on tax-exempt bonds. The last two debt issues by the City of Hartford have included a portion of the overall borrowing that did not qualify for tax-exempt treatment, raising the overall cost of borrowing. The Hartford Stadium Authority issued taxable bonds to fund the construction of the non-public portions of the ballpark. The City itself issued taxable bonds in the July 2015 restructuring used to balance the current year budget. Treasurer Adam Cloud stated that the City’s debt can only be refunded once with tax-exempt bonds. Subsequent refundings (of the same debt) are required to be taxable. Hartford has refunded a lot of bonds in recent debt restructuring efforts. The total is $272.5 million in 6 issues since 2009, of which $240.8 million is outstanding. Refunding bonds represent over 58% of the City’s total outstanding debt. As a point of comparison, refunding bonds represented just 20% of the City’s outstanding debt as of June 30, 2012. How do the maturities of the Refunding bonds compare to the Original issue bonds? The City’s debt profile can be separated into refunding issues and original issues. In the chart below, the original issues are shown in blue on the bottom. Refunding issues are shown stacked on top in red. For both series, the darker portions of the bar represent scheduled principal payments and the lighter portion represents scheduled interest payments. Each column represents the scheduled debt payment for a fiscal year. The dark blue section with the thick border at the bottom of each column represents the portion of that year’s obligation that could be restructured using tax-exempt debt. 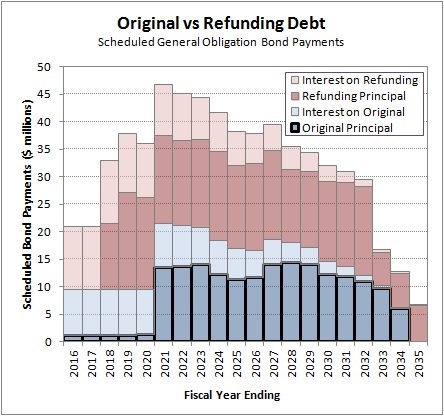 There are virtually no original issue principal payments due through fiscal 2020 that could be restructured using tax-exempt debt. It is important to note that scheduled interest payments can’t be restructured away. If interest rates are favorable, then interest payments can be reduced by refinancing to a lower rate. Both postponing principal payments into the future, and accepting higher interest rates, will cause near-term interest expenses to increase. How much higher is the taxable interest rate? 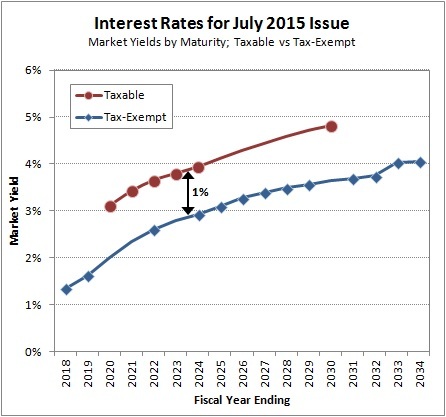 The July 2015 issue included both taxable and tax-exempt bonds. Plotting the market interest rates from the Official Statement allows a rough yield curve to be drawn, comparing interest rates based on maturity and tax classification. The market charged Hartford a 1.0% higher interest rate on the taxable debt than on the tax-exempt debt. If Treasurer Cloud’s statement is accurate (and complete), then the sharp increase in refunded debt over the past 3 years has important implications. The City has very little near-term debt that can be restructured with tax-exempt bonds. And the financial markets charge meaningfully higher interest rates for taxable bonds compared to tax-exempt bonds. Future debt restructurings will be much more expensive for Hartford than they have been in the recent past.